Recently, my boys went on their first field trip of the school year to a farm and they each came home with a pumpkin. Pumpkin isn't something I cook except for the time I made a Pumpkin Pie on Hasan's request. I asked the boys what they would like me to make first with their pumpkins. They immediately said cookies. I found this recipe on Joy of Baking. It is not like a traditional cookie. It's very soft, almost cake like. They were a big hit. Chocolate chips or walnuts would be a great addition to these cookies. I made half the recipe below and got 9 big cookies. The original recipe had a cream cheese frosting. I was taking these for an after school snack when I picked the boys up from school so I didn't have time to frost. In the end, I'm glad I didn't. These were great as is. We've got a lot of pumpkin leftover, so get ready for some more pumpkin recipes! Preheat oven to 325°F and line 2 baking sheets with parchment paper or silpat. In a large bowl, whisk together flour, baking powder, baking soda, cinnamon, ginger, cloves and salt. In the bowl of an electric mixer fitted with the paddle attachment, add the eggs and sugar. Beat until light and smooth. Mix in the oil, vanilla and pumpkin puree. Add the flour mixture and mix until just incorporated. 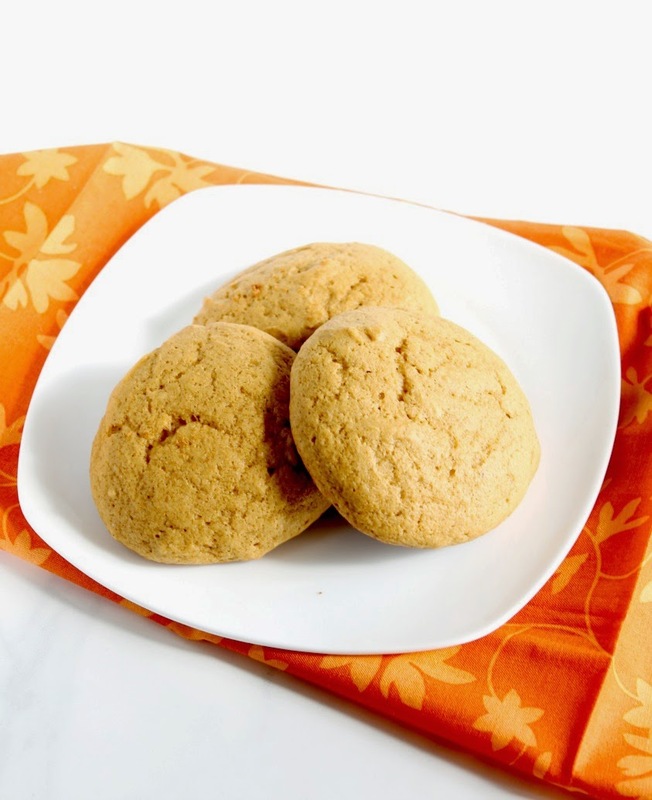 Using a 1/4 cup measure, place mounds of batter on prepared baking sheets, leaving 2 inches between each cookie. Bake 15-18 minutes or until a toothpick inserted in the middle of the cookie comes out clean. Transfer to a wire rack to cool. Oh soft cookies are my fav! These look and sound wonderful! These look great! I'm like you where I avoid frosting if it isn't necessary. The flavor of the pumpkin and the spices shouldn't be masked by the frosting!